Alexander Davidson (1842-1911) – Temple Lodge, No.33, Duncan, B.C. At present, all we know about Brother Alexander Davidson (27 February 1842 – 12 November 1911) comes from Temple Lodge, No. 33 records. According to the Temple Lodge, No.33 Minute Book, Alexander Davidson was born in Aberdeen, Scotland; was a member of St. George Lodge, No. 190 in Aberdeen; made a Petition for Affiliation with Temple Lodge, No. 33 on 14 November 1908, stating that he was a shipwright and a resident of Duncans, B.C. Alexander Davidson was elected a member of Temple Lodge by affiliation on 12 December 1908. He apparently died in Alberta (at this time we don’t know where or how) on 14 November 1911 [note: the 14 November date comes from Temple Lodgfe, No.33 records. 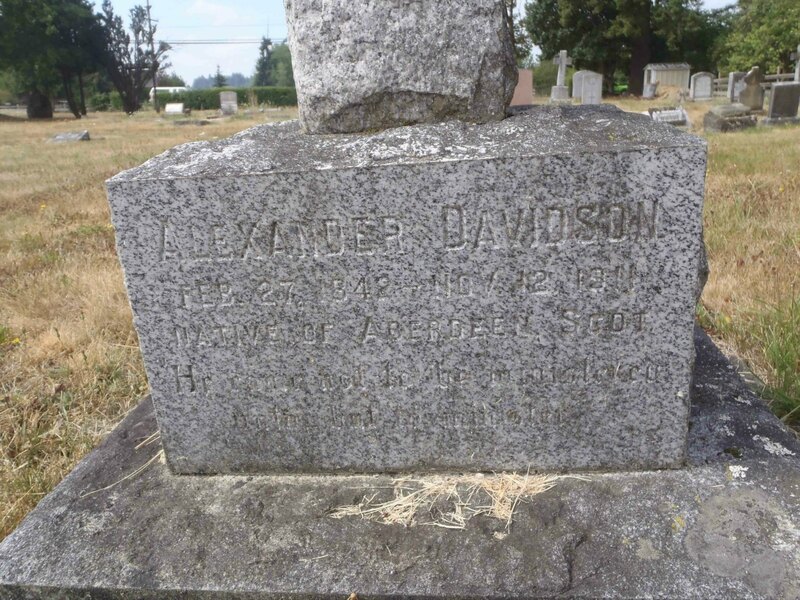 Alexander Davidson’s grave stone says 12 November 1911]and his remains were returned to Duncan for burial. He was buried with full Masonic ceremonies by Temple Lodge, No. 33 in St. Mary’s Somenos Anglican cemetery on 28 November 1911. “…Application from Bro. Alexander Davidson aged 65 years Profession shipwright Residence Duncans for membership by affiliation. Moved by Bro. A.H. Peterson seconded by Bro. Gidley that the application be received and the usual investigating committee appointed. Carried. “…..Committee on Bro. Alex Davidson reported favourable. Moved by Bro. Gidley seconded by W. Bro Peterson that the report be received, the committee discharged and the candidate Ballotted for. Carried…. A procession was formed and the remains of our late Brother borne away and tenderly laid to rest with the solemn formalities and ceremonies of the institution in the cemetery of St. Mary’s Church, Somenos, B.C. Alexander Davidson is buried in St. Mary’s Somenos Anglican cemetery. 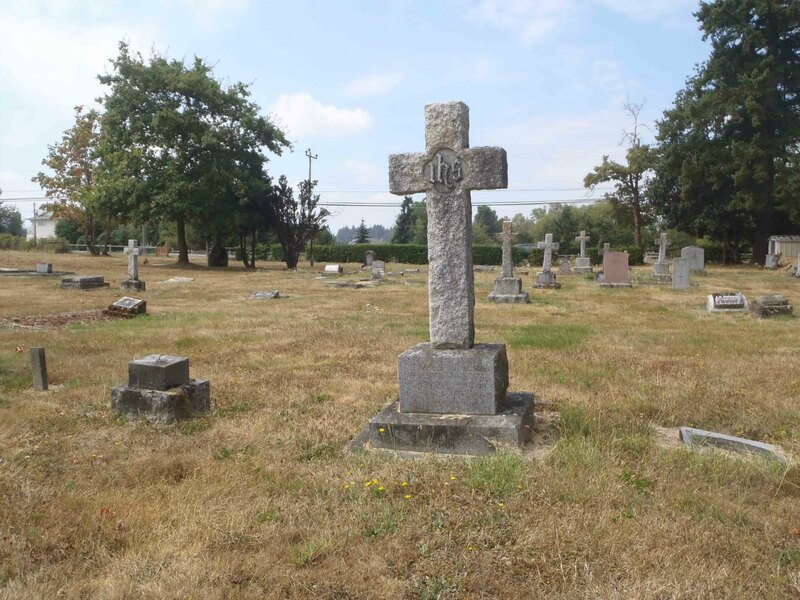 Alexander Davidson grave, St. Mary’s Somenos Anglican cemetery, North Cowichan, B.C. Alexander Davidson grave stone inscription, St. Mary’s Somenos Anglican cemetery, North Cowichan, B.C.